The Fire element inspired the direction giving and networking in the organization. So the focusing on survivors participation in all programmatic planning, implementing and monitoring; the focus on investing in field social workers in our partner organizations and the focus on the cycle of testing, implementing and learning from there, was the way to go for us..the direction we set for ourselves. And keeping this direction of programming in mind, networking with other organizations (donors) and individuals for raising awareness on Sanjog’s work, vision and programmes, became one of the key activities we did. Meeting Foundations, sharing our project ideas with corporate philanthropists and engaging with national and state governments has been core networking and lobbying initiatives with the founder members of Sanjog were super busy with prioritizing, branding, messaging and marketing. Implementation (the Metal element) saw the achiever in us in full swing. We implemented two big projects in the last year with absolutely 3 new pilot initiatives. A big leap, taken with lots of conviction and tentative capacities but we went all out for it. We ensured quality control of these programmatic activities- psychosocial trainings, researches, advocacy initiatives, monitoring assignments, managed changes, followed planned strategies of implementation and tried to achieve set targets in time. This part of Sanjog’s work exhausted us since we were all implementing, learning and re-learning on the job but we went ahead and did them with as much rigor and integrity as we could. And the end of the year was then spent in consolidation and reflection. Consolidation (the Water element), is as I see it, the most important part of the organization which inspires us to carry on. It’s like the digestive system. So this process tells us, what worked, what didn’t, why, when, where and how should we move ahead. The philosopher in us is who we wanted to evoke in this process- to take stock of what we did, conduct appraisals and evaluations, manage resources and see where we are standing in reference to the bigger picture. Looking back, the highlight of the last year was the faith on the organizations capacities and capabilities by two international organizations and their investment in the organizations institutional and programmatic growth. 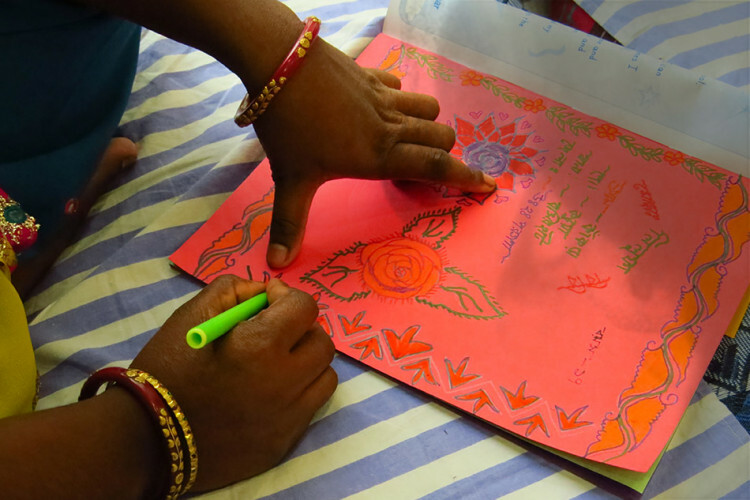 Both Anesvad Foundation (Spain) and Kamonohashi Project (Japan), invested in Sanjog..in its pilot/ experimental initiatives on Restorative Care, Survivors’ leadership programmes and legal research initiatives. And we experienced both the highs of successes and the lows of challenges in these programmatic journeys. All of those have been captured in snapshots in this report. So here’s looking forward to another year of learning, experimenting, stumbling, getting up, walking and running for all of us at Sanjog… and this year, shall not forget to celebrate more!